From the beginning of history, there has been a certain few incidents, accidents, inventions and moments of pure genius that has led to the shaping of our future. Certain products, commodities, theories or discoveries have changed our planet, the way we live and how we see ourselves as a society and as beings. From the Guttenberg printing press to the Microchip to the development of the power grid, each new marvel has allowed us to take giant strides into the future. The Wright Brothers, to the concord incident to the massive Boeing 747 in today’s world. The same goes for the locomotive industry and also the car making world. The car industry was initially dedicated to making products only for the elite and the higher strata of society. Then the genius of the Ford T model revolutionized the car industry bringing in affordable cars to the Americans. But then came the giant stride years hence, made by the German company Volkswagen. The car makers brought out from its factory belt something that has remained on as an icon, a cult model for our modern society. If you still haven’t guessed, we are talking of the Volkswagen Beetle. The Beetle has its name enlisted in many a record list. The Volkswagen Beetle has been under production since 1931 and had been churning out of the factory line till as late as 2003. No other car comes even close to this astounding tally. The Volkswagen (which literally means the people’s car) Beetle was the car that took the European car industry by storm. 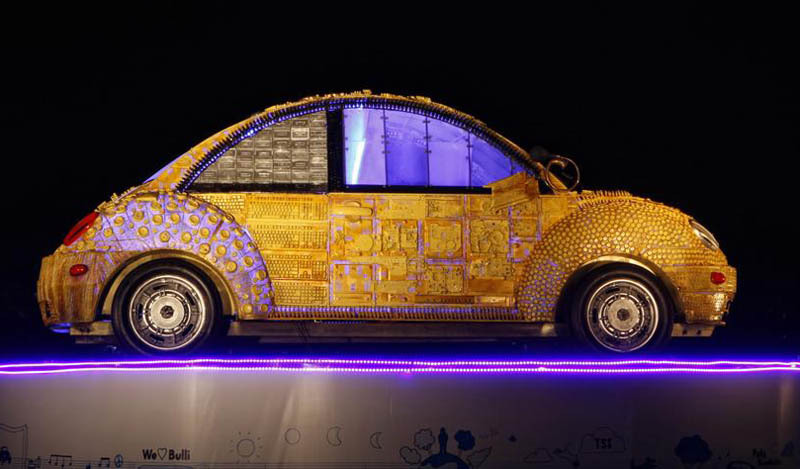 And as a ‘thank you’ note some of India’s creative geniuses have dedicated a scrap model of the Volkswagen Beetle for show at the Kala Ghoda Festival. The festival is going to be from the 4th of February to the 12th of the same month. The model is decked with 2805 pieces of scrap making it an awe inspiring piece of art. 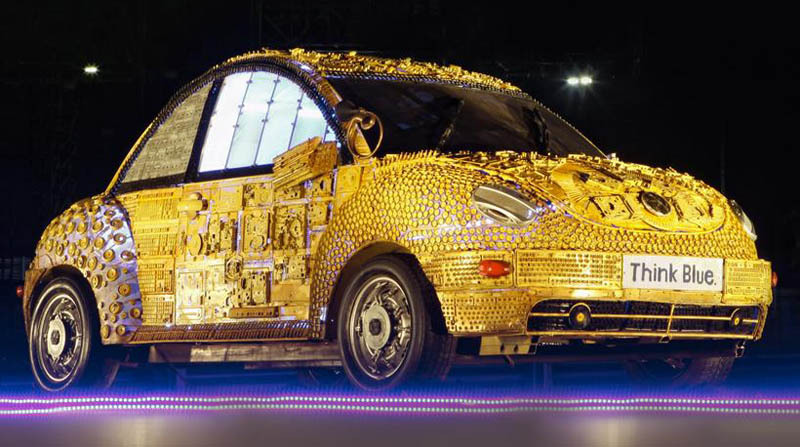 This life size model has been created down to the last detail, a beautiful copy of the Beetle. The scraps have been collected by the designers from an amassed pile gathered by the Think Blue clean up drive undertaken by Volkswagen. The designers while dedicating this artwork to the revolutionary idea, that was the Beetle, infused the idea and the brand philosophy of Think Blue in building the model. All components, scraps and junk that were collected by the Think Blue program were to create awareness towards building a sustainable environment. The list of items used in the making of such a design is endless. Amongst them the most frequently used are the spark plugs and cold drink caps, whose numbers run up to 800. Others include about 200 bottle caps, 60 mother boards and a whole lot of other fried and non functioning gadgets, the likes of key boards, hard disks, mother boards, CDs and DVDs, cassettes and speakers. Even items such as beer cans, barbecue sticks and pens have gone in into the making of the magnificent design.